IFTTT basically automates the Internet, letting you create recipes to bridge various products and online services—you can get a text when there’s rain in the forecast, for example, or have your Belkin WeMo Switch turn on your lamp when the sun goes down. While IFTTT works with dozens of popular services, all its functionality was rolled into one website and mobile app—until now. On Thursday, IFTTT launched three new “Do” apps for iOS and Android, and the original IFTTT app we already know and love is getting a new name—going forward, it’s just IF. 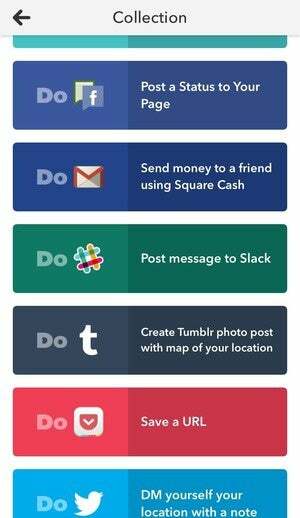 In fact, IFTTT is now a company with two separate products, Do and IF. The new Do apps are a play on what IFTTT is known for, but unlike the old IFTTT app experience, each of the new apps requires an explicit interaction on your part. Each app limits you to just three recipes, which cuts the clutter and makes you more thoughtful about which three recipes to pick. Do Button, Do Camera, and Do Notes each offer the means to connect many of IFTTT’s channels to a button within the app (or the same button in a widget). That digital button, when pressed, triggers a recipe. For example, within Do Camera, you can create a recipe that posts a photo to a specific Facebook album at the press of the shutter button. Do Button can provide easy access to your Belkin WeMo gear (and a prettier interface than Belkin's own app). Within Do Notes you’ll find only a text field and a button. The combination of the two makes it possible to quickly add an event to your Google Calendar, send a tweet, or save a quick idea to Evernote without having to deal with multiple apps. Do Button creates a simple mechanism for you to set your Nest thermostat to a specific temperature, control lights in your home, or fake a phone call to get out of an awkward situation. Launch the app, tap a button. As easy as pie. The first time you launch any of the apps, you’re greeted with a basic recipe, and after that you can create and manage your own magical concoctions. If you’re struggling to come up with an idea—as I was at first—the IFTTT team has curated recipes to get you started. Curiously, each app is limited to three active buttons. This is a departure from the IF app, which allows for unlimited recipes. The thinking here, explained to me by IFTTT’s CEO Linden Tibbets, is to eliminate the clutter and extra steps most apps and services often require for interaction. You get a lot of recipes to choose from. Just choose wisely. That makes sense; I can’t tell you the number of times I’ve tried to use a Reminders-like app only to stop using it because the process for entering information starts to feel like a chore. Tap here. Scroll down. Select that. Type there. Check this box. Deselect that box. 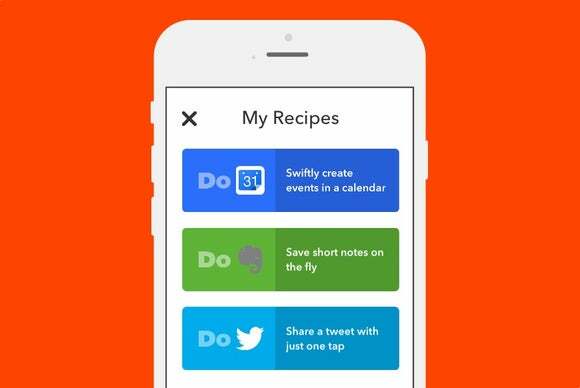 With Do Notes, you launch the app and start typing. When you’re done, you tap on the button and close the app. A cheerful chime sounds when the recipe runs successfully, so you aren’t left wondering if anything happened. Not only does the limit of buttons streamline interaction, but it forces you to evaluate what’s important. Instead of adding a recipe to your account on a whim, hoping you’ll need it one day, you have to think through how valuable each action truly is. Well, in the Do apps, anyway—my IF account is still full of such less-than-essential recipes. As with IFTTT, the usefulness of recipes can reveal themselves over time—like me, you may find yourself hemming and hawing over which recipes will benefit you the most. Three buttons times three apps—all crucial enough to need one-button access—can cause quite the inner debate. The convenience is certainly appealing, and I can’t wait to see what recipes other users dream up.